Upon the release of the newest addition to the Fast and Furious franchise, we thought we would take this moment to celebrate some of the best and most memorable car chases in movie history. There have been so many amazing car chases over the years; it’s what keeps these kinds of movies so thrilling, and keeps us coming back for more each time. This then, was not an easy task. However, we have managed to narrow it down to just nine of the best. In no particular order, here are nine of the most memorable car chases in movie history. Check them out, and then take our movie car chase quiz to test your knowledge on these and more. WARNING: there may be some explicit language in one or more of the clips below. Generally accepted to be the car chase that set the tone for just about every cinematic car chase since, 1968’s Bullitt still stands as one of the best ones to date. It helps that Steve McQueen himself was behind the wheel. A high speed car chase through the narrow streets of a European city is a common occurrence in action movies these days, but Ronin is the flick that really set the trend back in 1998, giving a car chase a realistic and exciting thrill for the one of the first times on screen. Many people nowadays are more familiar with the 2000 Nic Cage version of this movie, however, it is the 1974 original that contains one the most iconic–and certainly the longest–car chase scenes in history. As a sequel, The Matrix Reloaded certainly has its shortcomings. However, one gift that it gave us was this killer freeway chase scene. Take those city streets from Ronin, make them narrower, and add a Mini, and you have the car chase from 2002’s The Bourne Identity. This epic chase scene is one of the things that turned this adaptation into one of the biggest action movie franchises of the decade. Terminator 2 gave the world some of the best movie quotes in history, but also one of the best chase scenes you’ll ever see. 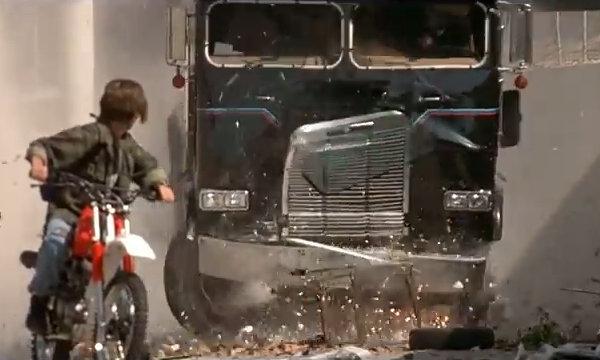 After all, how could you possibly beat the sight of a tractor tow barreling off of a bridge, and Arnold Schwarzenegger reloading a shotgun with one hand while driving a motorcycle with the other? Staying with the Los Angeles river, another famous car chase occurs in that same location–in To Live and Die In L.A. This scene has a realistic feel to it, and puts the audience right in the driver’s seat. Warning–this clip contains strong language and violence. “You want out of this parking lot?” Just when you think there are no new ways to show a car chase on screen, along comes the 1980 classic The Blues Brothers and the infamous mall chase scene. Long before Jason Bourne hijacked that Mini, Michael Caine and co. first demonstrated the many qualities of the British compact car, as they drove them through the streets of Turin. This is one car chase that is simply a joy to watch. What is your favorite movie car chase? Let us know on Facebook!